This is an exciting and historic day for Canada! 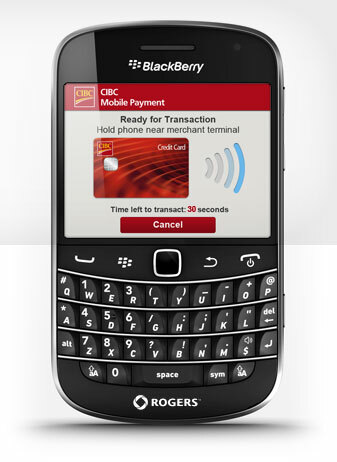 Today Rogers Communications and CIBC will team up to complete the first mobile credit card payment in the country, launching the new program initially on the Rogers BlackBerry 9900 and 9360 with other devices to be introduced at a later date. These BlackBerry smartphones are NFC enabled, which will allow customers to pay for items at retailers using their CIBC credit card. The program was announced several months ago, and is finally launching. By teaming with Rogers and CIBC, clients will soon be able to experience the convenience of paying at the checkout counter with their mobile device while enjoying the existing benefits and security of their CIBC credit card. Since clients will be able to access their existing CIBC credit card, they will continue to earn loyalty rewards as they do today. The first mobile credit card payment in Canada will be made this morning in Toronto at a Tim Hortons, with David Williamson (Senior Executive Vice President and Group Head, Retail & Business Banking, CIBC), David Robinson (Vice-President of Emerging Business, Rogers Communications), and Simon Whitfield (Olympic Triathlete and medalist) present for the event.